Coin collectors will find a tremendous selection of coins, collectible coin sets and currency at Littleton Coin Company, along with quality displays, albums and coin collection supplies. 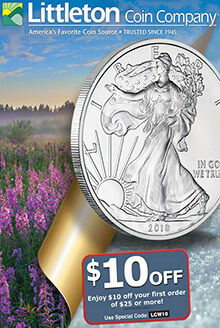 Enter the code - LCW10 - at checkout on the Littleton Coin Company website. Valid for first-time catalog purchasers only. Cannot be combined with any other special offer.